Last night in Game 1 of the National League Division Series between the Reds and Giants, Cincinnati ace Johnny Cueto left the game after 8 pitches with back spasms. The Reds went on to win the game 5-2. That scenario raises the question: would the Reds rather have won the game or emerged with a healthy Cueto? At this point, it appears Cueto will try to pitch Game 3, which makes the answer pretty obvious, but what if Cueto were out for the rest of the postseason? 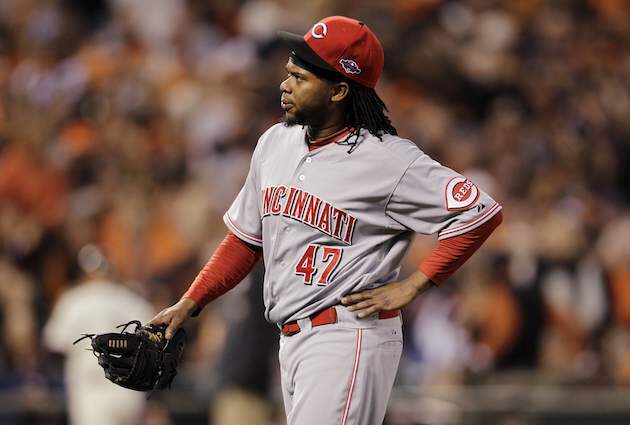 If Dusty Baker had been offered that devil’s bargain, would he have said goodbye to Cueto in exchange for the victory? And which players around baseball, now or historically, are so vital to their teams that the squads would be better off forgoing a postseason victory to keep them healthy? Does such a player exist? And at what point in the postseason is it most optimal to forgo a victory, given the obviously imaginary situation that such a choice is your to make? To me, it seems obvious that the Reds should prefer to have a win in their pocket rather than a healthy Cueto, particularly in the first game of a best-of-five series, which are notoriously volatile. Sure, the Reds are a better team than the Giants and could easily comeback from a 1-0 deficit, but I doubt they’d be willing to bet their season that they could take three out of four from San Francisco. Wins are so important and so hard to come by in the postseason that teams should be hypothetically willing to sacrifice almost anything to get one. Plus, the history of the postseason is littered with stories of teams who surged despite losing one or more of their best players. Having that win in hand just means too much — teams can scramble and adjust and find ways to get by without their ace or their premier slugger. Cincinnati — Cueto just might be the Reds’ most important player, given the depth of their offense and their success this year with Joey Votto on the shelf. Still, it’s a clear choice: take the win. San Francisco — You could make a case for either Matt Cain or Buster Posey, but you can’t make a case that the Giants would be better off forfeiting a win to keep either on the field. Washington –– Bryce Harper led the team in bWAR despite an inconsistent rookie season, showing that this team is too deep to rely on any one player so heavily. St. Louis – Yadier Molina is undoubtedly even more important to this team than the stats show. But still, he’s a catcher. And a Molina. Baltimore – This band of merry misfits, like Washington, doesn’t lean too heavily on any one guy. Probably because they don’t actually have any good players. If they had to pick, it would probably have to be closer Jim Johnson. New York – It’s C.C. Sabathia, and this is one where the Yankees’ rotation depth is weak enough that it would almost make sense to take a healthy Sabathia over a win, but not quite. Detroit – Verlander or Miggy? Miggy or Verlander? Because of the nature of short series, I would lean toward the starting pitcher, and as with the Yankees, this is a close call, but I think you still have to take the W when given the choice. Oakland – Like the Orioles, the A’s are a team of depth rather than stars-and-scrubs. So that’s that. But what about different points in the postseason? Clearly, if your team is up 2-0 in the LDS, you’d probably be willing to drop a game to keep your best player. But at any other point in a best-of-five, including up 2-1, you have to take the win. The ALCS and NLCS offer a little more leeway being best-of-seven. While still a short series, those extra games provide enough cushion that you’d probably accept losing an early-series game to keep your guy on the field, at least in the cases of Detroit and New York above. Then, once you get to the World Series, you’re so close to the finish line and there are so few games remaining that the situation reverts back to where it was early in the postseason, with the win being the most prized commodity available. Now that we’ve indulged in this exercise, let’s hope Cueto can stay healthy because the playoffs are little less interesting without him.